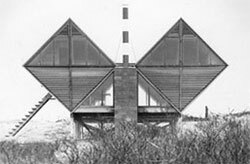 One of the most renowned mid-century modern beach houses, The Pearlroth House has been a famous landmark on Long Island since it was designed by Andrew Geller in 1959. The Modernist gem is featured in both architectural and design magazines, but it fell into disrepair and was in danger of being razed. Then Jake Gorst, the grandson of the architect stepped in and set about trying to raise enough money to relocate it to another site in Southampton, NY and to restore it to its original glory. Exhibitions International is helping the fundraising effort to save The Pearlroth House by hosting a cocktail reception at the Center for Architecture, 536 Laguardia Place in NYC on October 27, and a tour of modernist architecture on Long Island on November 4. Too many of these unique houses are lost each year and we have an exciting opportunity to preserve this one for future generations to enjoy. Contributions can be made via paypal and are tax deductible. Steven and I are trying to ensure that our wonderful house, also designed by Mr Geller, remains a home for our family and for those who are lucky enough to live here after us.